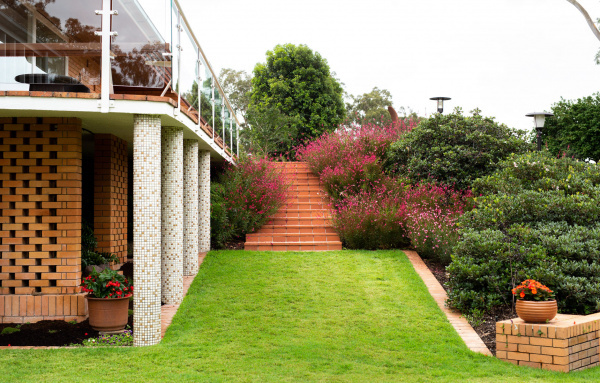 Today we share a piece of living heritage in inner-city Sydney. Established in the mid-1800s (!! ), Bronte House and Gardens is the oldest known residence in the Waverley Council area. The breathtaking home and gardens are now cared for by passionate custodian Anna van der Gardner, who took us through the grounds to find out more. Bronte House is the oldest known residence in the Waverley Council area. Photo – Daniel Shipp. The house was built in 1845 and was once part of a large 45-acre estate. Photo – Daniel Shipp. Anna van der Gardner. Photo – Daniel Shipp. The circular pond and fountain is part of the early garden, built in 1886. Photo – Daniel Shipp. The garden at Bronte House is lush and glorious. Photo – Daniel Shipp. Bronte House has changed hands many times over the years. In the 1960s it was a wedding venue, according to Anna. Photo – Daniel Shipp. The property is open a couple of weekends per year. Anna loves having the opportunity to share the house and garden with visitors.’ I love seeing people here, and showing them around. I feel a bit selfish when it’s just me here by myself.’ Photo – Daniel Shipp. Beneath the eastern lawn lies a shady, leafy garden meandering around Bronte gulley. It’s a magical place. Photo – Daniel Shipp. Lush planting frames the pathway leading from the entry garden to the eastern lawn. Photo – Daniel Shipp. There are many old plants in the garden like the giant bamboo, thought to have been planted by Georgiana Molloy in the 1860s. Photo – Daniel Shipp. Anna and the team at Pepo Botanic Design are constantly tweaking the planting in the garden. It’s a never-ending process! Photo – Daniel Shipp. Bronte House is owned by Waverley Council and is open to the public six weekends a year. It is significant in that it’s a relatively intact example of a house decorated in the ‘gothik’ style popular in the 18th and 19th centuries. Photo – Daniel Shipp. Form and texture. Clipped box (Buxus microphylla), dark purple NZ flax (Phormium tenax cvs.) and the soft form of saliva (Salvia spp.) in the entry border. Photo – Daniel Shipp. A very happy tractor seat plant (Farfugium japonicum cvs.) Photo – Daniel Shipp. Whilst Anna has always been a keen plant person, taking stewardship of Bronte House has been a steep learning curve. She’s in gardening heaven! Photo – Daniel Shipp. Imagine arriving home to this vista every day? Photo – Daniel Shipp. ‘I’m so passionate about gardens and I’m so passionate about heritage.’ – Anna van der Gardner. The property, originally a 42-acre estate, was bought by William Mortimer Lewis in 1836. He began to build a house, but ran out of money and was forced to sell. Robert and Georgiana Lowe purchased it as their ‘country residence’, finishing the construction of the house in 1845. It’s described in the NSW State Heritage Register as a ‘magnificent, Mid-Victorian mansion’ as well as ‘an amusing mongrel “Gothic-Italianate” design’. The Lowes only lived at Bronte House for four years. Following this, the property changed hands a number times before being sold to Waverley Council in 1948. Restaurant critic and arts festival director Leo Schofield took stewardship of the property from 1994 until 2002. It was during this time that the garden was restored and re-invigorated by Schofield and landscape designer Myles Baldwin. Towards the end of his time at the property, Schofield wrote a book about the garden at Bronte House (The Garden at Bronte, 2002). It’s an invaluable reference for Anna. ‘It’s my guide’, she says. A look back through the most popular gardens we featured in 2018.